Highlights of coming to Helen’s caboose have to include the flicker sitting calmly on a sign warning people to keep vehicles on the road from that point. a photo op missed, except in memory. Helen is at the far end of the East Coast Trail. the road is terrible; it’s a good thing Helen has a good vehicle. But once arrived at the caboose, all that seems irrelevant. The view is pristine, the air clear, the waves roaring. The next day we start climbing the trail.You are well aware Len, what a lazy wimp I can be. Nothing stops you, or Helen, and besides, there are partridgeberries to pick, and me to train as a picker. You know what a lazy wimp I can be. 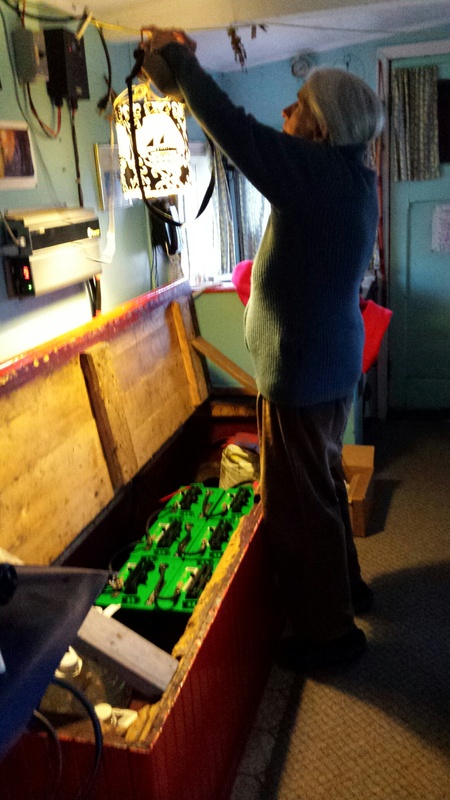 Nothing stops you, Len, or Helen, and besides, there are partridgeberries to pick, and me to train as a picker. The trail starts just up the hill above where the lighthouse used to be. When Helen shows me the photo of the beautiful old building, we are all sad because of the ways of modern humans, sad because the lighthouse does not exist anymore, that it was beautiful and supported a family. Another photo I haven’t taken, that bare area where the house used to be.There’s a plaque at the start of another trail that shows where there had been a church. Seven pews, that’s all. I saw a photo of it in a book at the Pouch Cove Library. The area is rich in the preservation of its history. But we started to climb to the trail with its beautiful views, stepping over roots, over twisted dry tuckamore roots, until Helen discovered partridgeberries. Well, wasn’t our climbing slowed down after that; our eyes were peeled to the ground for more patches, until we came to a cove, which ordered us to stop and take notice. We climbed higher until we could look down on Biscaan Cove and the caboose, Mad Moll flashing in the cove. Another day and another part of the trail, this time after rain which enhanced colours. 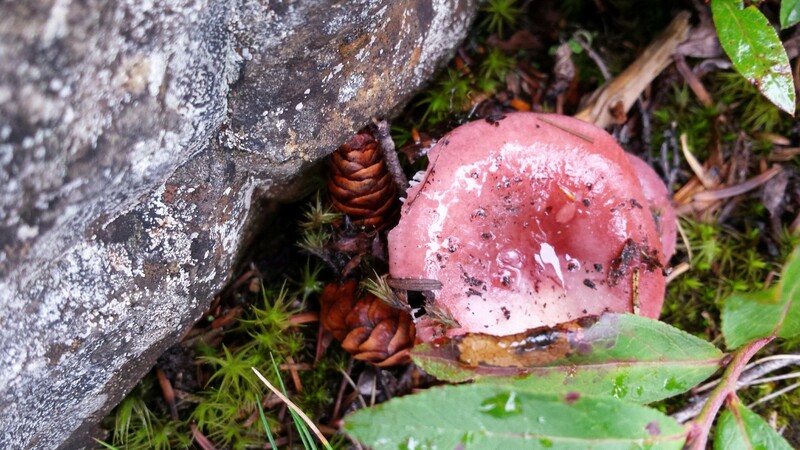 A little mushroom that looked like a rose… moss on a rotting log. 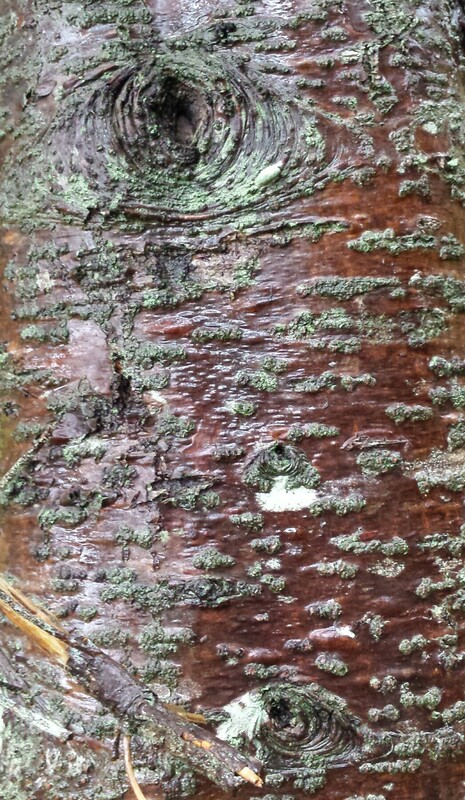 Spruce bark in the witchy wood captivated me, as did all manner of berries and rocks. You and Helen great at pointing out the different berries, saving eight late blueberries for me. 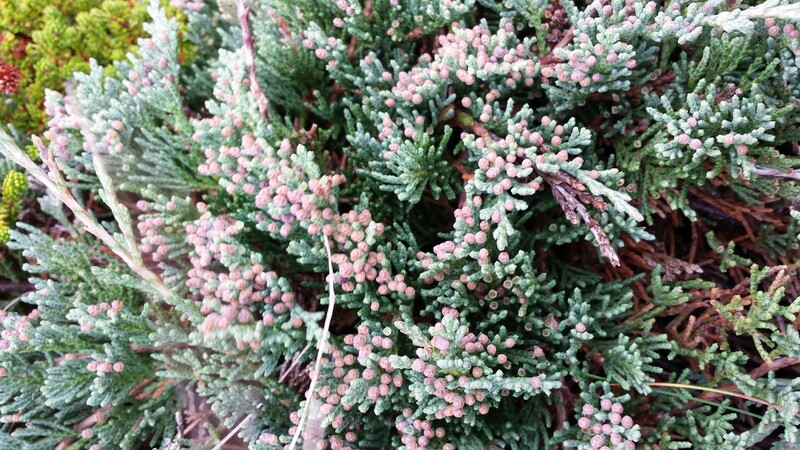 Leaving was hard, saying goodbye to Helen, and to the tiny pink buds of the crawling juniper. But then we had to go, and set off on the road to Fogo. I was early for that ferry. I didn’t mind a bit. I had stopped by the side of a road and found a tiny wild orchid that is, perhaps, galearis rotundifolia, which was exciting. I know I wrote about this before, but it was on my mind again today, such delicate loveliness among the weeds. 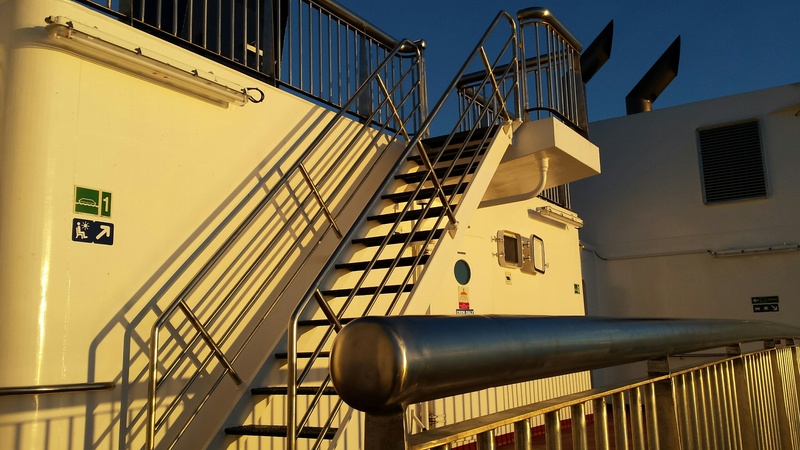 What’s not to love about driving on a ferry and being asked, “Got yer ticket, my darling?” The ferry is huge, and as always with ferries, I am intrigued. I love the play of shape and light wherever you turn when the sun is going down. 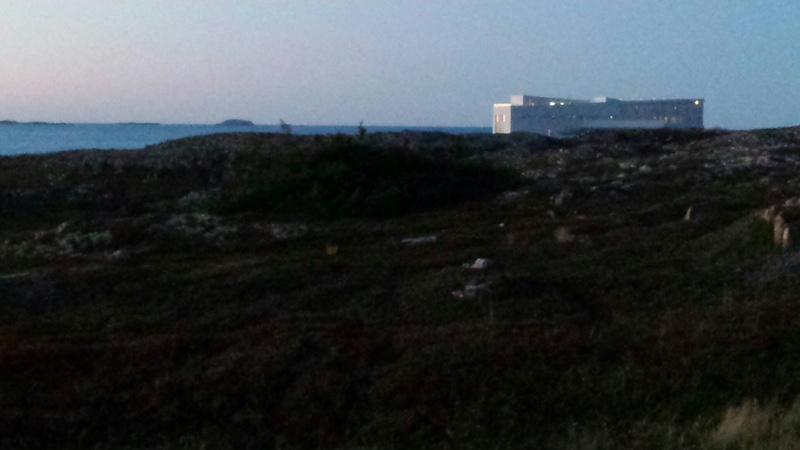 Early on I catch sight of, in the dying light, The Fogo Inn. I’ve been interested in it, in seeing it, in watching videos about it, in its owner, ever since I first heard about it. And there it was, on the rocks, barely lit. Like a holy thing on an altar. The light shifted and I was driving in deep dusk among, supposedly, caribou. Caribou. They are supposed to be all over this island, but I can’t catch sight of one. Two people staying at this B&B claimed to have seen Winston J. Osmond, local painter, proprietor of The Herring Cove Studio at Shoal Bay (pronounced Shawlbee) and carver, also known for his bakeapple, marshberry, partridgeberry and blueberry jams, walking along the road carrying the head of a caribou, just hunted, but the sign will probably be all I will ever see of a caribou. 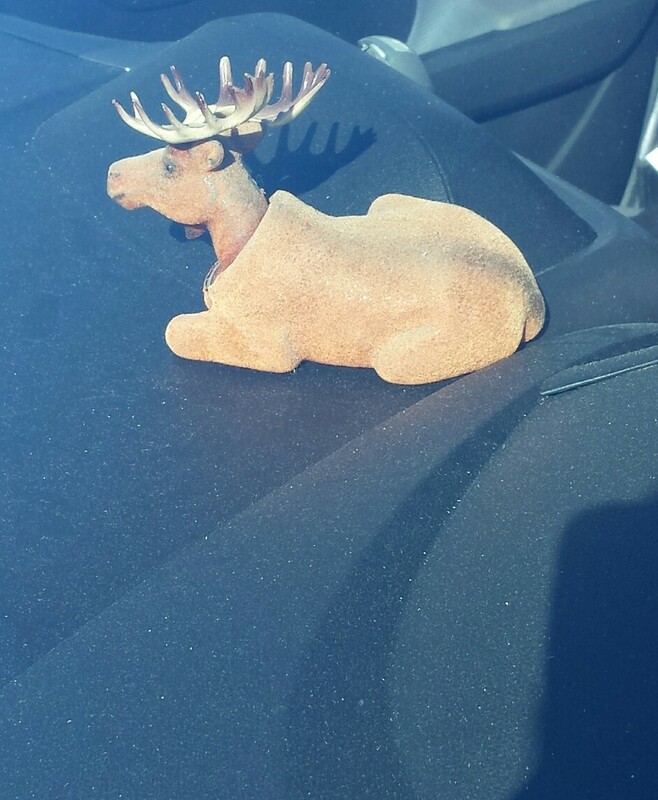 Or else this little bobblehead, sighted on the dashboard of a man who looks as if he’d hunted them for the past hundred years. His toothless grin when I asked permission to take a photo. 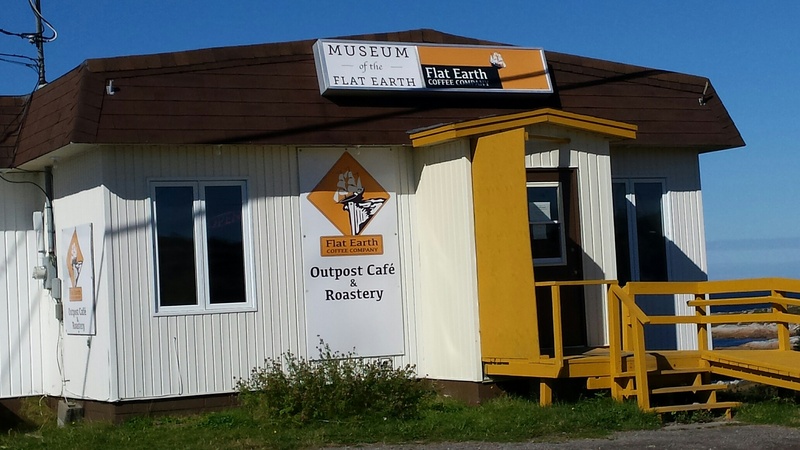 Many interesting things here, like The Flat Coffee Café and Roastery, Brimstone Head, Fogo’s Brimstone Head is supposed to be one of the four corners of the flat earth. 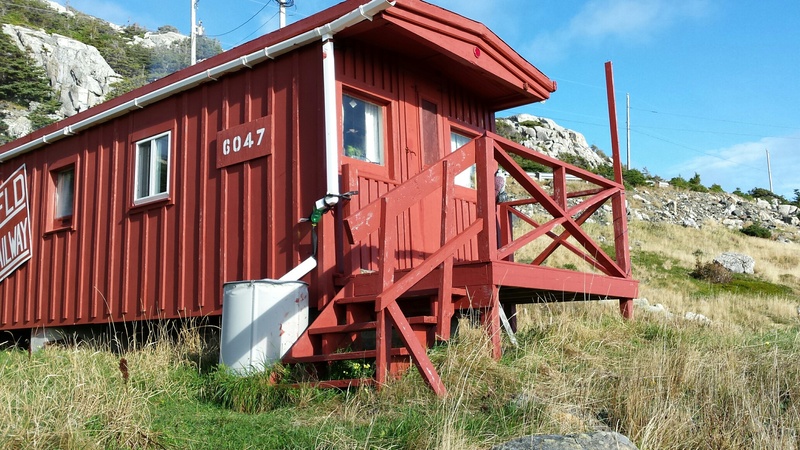 The café is closed after tourist season, but its roasted beans are sold all over the island, at the Fogo Inn and on the Ferry. Good stuff. 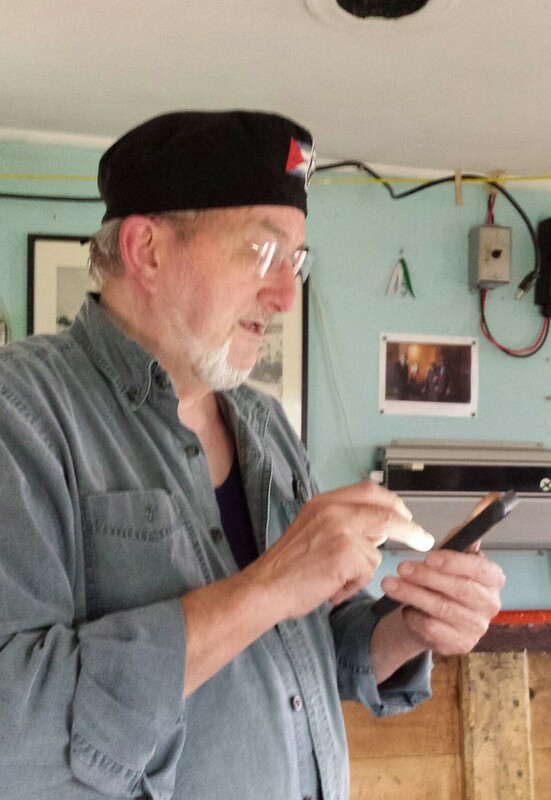 And on to Foley’s Place at Tilting where owner Tom Earl is known for what he produces in his kitchen… partridgeberry scones, and on special occasions, seafood meals of cod, shrimp, scallops and crab taken from waters right here at Tilting, and garden produce from local gardens. It’s a great place to be washed up, right at the start of Turpin’s Trail, and a museum full of surprising things. I posted pics from the trail last time because I was so struck by its beauty, but there is so much more to it and this area. Len feels he is very close to his roots here, and is happy.